Spiroh, where is the center image? Is it in front of the drivers, in the plane of the drivers, or behind the drivers? How is the soundstage depth? I have this setup in my office. I got better imaging and sound by having the speakers tilted in facing about 1 ft in front of me. Depth is good, no complaints there. I'm currently running them off a Marantz SR6009 and it can get plenty loud with good bass impact but at some point i would like to get a dedicated amp for them but it's an office so that might be overkill LOL. Might there ever be signature versions of M5,M100 etc that would have thicker cabinets,die cast drivers and cross-over upgrades? I am a long time Axiom user and have really loved them but I have eaten from the evil Bryston tree and the Mini-T is a stellar performer. I am guessing the difference are the above mentioned items. I think the HP drivers have trickled down but will anything else come along?? The Mini-T has an 8" woofer compared to the M5HP. It's also twice the price of the M5HP. Why would Axiom want to position its products like Bryston when both Bryston and Axiom have good things going with their respective product lines? Sorry Mojo, I don't follow you, are you talking about the Bryston A series of speakers? I think landru is looking for the trickle down effect of the tech used in the Bryston line . 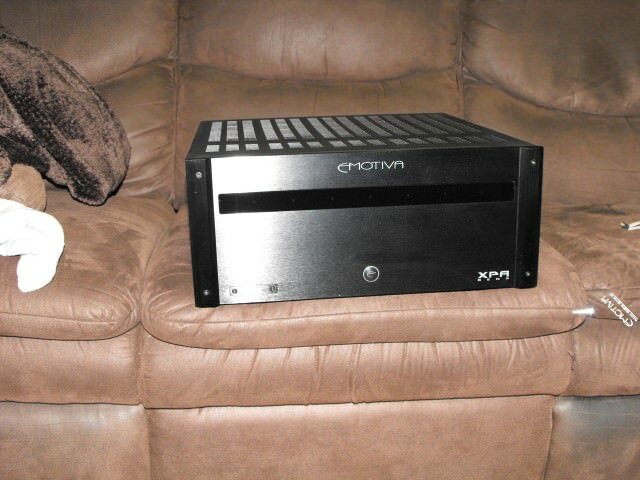 As mojo said it wouldnt make any sense to go up against yourself(Bryston) , since Bryston paid good money to have Axiom design and build the speakers for them, so Axiom would have to buy back that tech in essence. If you like the Brystons buy them, or just buy the Axioms if its out of your reach. The better question would be what does some of those items give? A thicker cabinet? Die-Cast drivers? A different crossover? Apart from having a much heavier speaker, I don't see the point. A die-cast driver likely makes any sound improvement or I know that Ian and Andrew would have put that into their speaker offering. It might look good on paper, but little to gain. The last you listed was a different crossover. That is where you get into the meat and potatoes. If you followed Axiom, you would know that they are one of the few companies that actually test speakers and work with a full 360deg family of curves to know how the reflections off axis will impact the sound coming out the front. They have played with their crossovers from the V3 to the v4 to get them better. If you wanted a better sounding speaker, then why don't you look at the LFR as then you are effectively moving into an active pre-processor that interacts with the crossover to get perfect timing and a real true sound out. Numerous significant improvements have been made over the years in all the drivers, enclosures, electronics and cross-overs. Also new products like the M5HP, VP160, LFRs, Air have been introduced. The subs now are an entirely different animal. Then there's also the Family of Curves and improved quality control. Axiom's HP drivers are cast. There are definite performance advantages of cast over stamped when a "larger" motor structure is necessary. Also note Axiom has "beefed up" the bracing in most of its speakers. See the YouTube videos. Cross-overs have also improved. I've been following Axiom's work closely. I don't believe any of these changes were inspired by marketing. I think when Andrew came on board Ian finally got the help he needed. The LFR and Model T projects likely catalyzed some new research that led to the changes. When you step back and look at what Axiom has done over the last 8 years, it's actually quite amazing!